The Chandler Engineering Model 8081 digital recorder provides secure data storage and digital backup of critical test data. 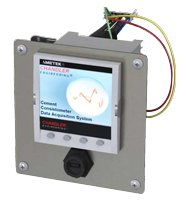 Previously sold as ancillary equipment on all Chandler Engineering HPHT cement consistometers, pen and paper chart recorder technology is rapidly becoming obsolete as industry demands change. The Model 8081 allows up to 27 days of continuous test data to be stored locally, which can be easily exported to Chandler’s 5270 DACS software via USB flash drive. If thickening time test data contains any gaps or missing data points due to a PC communication issue, a 5270 test file can be regenerated from the backup. Additionally, the digital recorder features a high-contrast color LCD display with several display modes, providing horizontal and vertical trends, large display format of all signals and historical data views. Sold as standard equipment on Chandler Engineering’s Models 7322, 8340, 8040D10 and 7025C10, the Model 8081 Digital Chart Recorder is available as a field-retrofit upgrade package to existing Yokogawa and Eurotherm Chessel recorders. Using the included hardware, the assembly directly replaces the paper chart recorder without modifying the original front panel.